Working from home has many unparalleled benefits ─ saving on gas, creating your own schedule, not having to stare at the grey walls of a cubicle, and working in your pajamas to name just a few. That being said, a great office space can help boost productivity and efficiency. While a plain metal desk, simple chairs, and overhead lighting may suffice outfitting your office space beyond simplicity can work wonders. Creating your home office is an excellent investment, which transforms your personal space into something unique that reflects your creativity. Whether you prefer a sleek modern look or an upbeat environment with RGB LEDs for a workstation or game station, there is a ton of hardware and furnishings to make the space truly yours. To help provide a bit of inspiration for your setup, we’ll take a look at some of the popular hardware and furnishing options on the market and the benefits they offer, including desks, monitors, mounts, keyboards, adapters, cables and more! The cornerstone of any excellent home office is the perfect desk. Any desk can do, but health studies have shown that sitting for long periods can be damaging to your health and recommend rotating from sitting to standing throughout the workday. This is where a sit-stand desk shines, as it provides the best of both worlds- maintaining a level of comfort in conjunction with improved health. 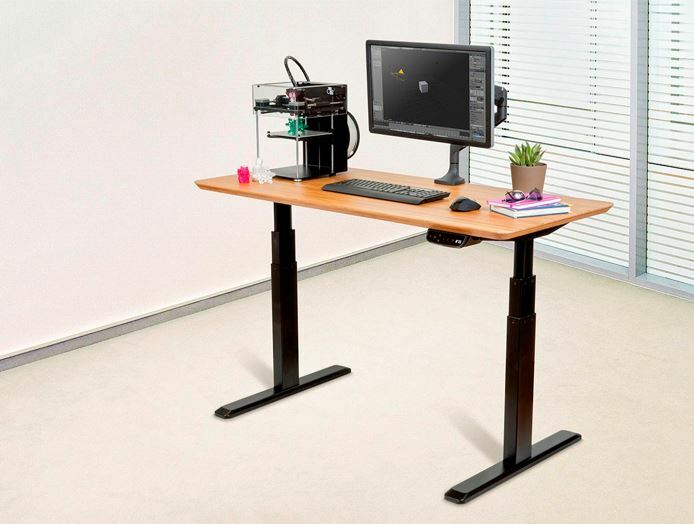 For those not familiar with the technology, a sit-stand desk is powered by a crank, pneumatic, or motorized system which allows users to easily adjust the height of their desk from sitting to standing. Motorized versions are the most popular as they can shift positions at the push of a button, with some having the ability to be programmed to adjust the height at specific times throughout the day. This type of desk is ideal for those looking for a complete desk package. For those who prefer the desk they are already using but would like to have the height-adjustment option, there are desk converters that can be placed on top of a desk (without altering it) and function like their larger counterparts. These too are motorized and feature large tops that can accommodate laptops, multi-monitor setups, and space for keyboards and mice. Some of the more advanced options also offer USB throughput for charging smartphones, tablets and other mobile devices. Why raise a whole desk if only a small portion needs to be elevated. If the lack of office space is an issue or a more streamlined, efficient desk is what you’re looking for, then a slat desk system can work well. Just as the name implies, these are modular storage solutions for organizing both standard and sit-stand desks. The slat railing system allows users to attach modular add-ons, such as pen/pencil holders, document/file trays, and even adjustable monitor mounts. The great thing about these platforms is that you can customize and rearrange your setup to match your needs without them being permanent desk fixtures. When it comes to monitors, everyone has their personal preferences, including size, resolution, preferred connection type (DVI, HDMI, DisplayPort, etc. ), single display or multiple-monitor setups, the list is nearly endless. 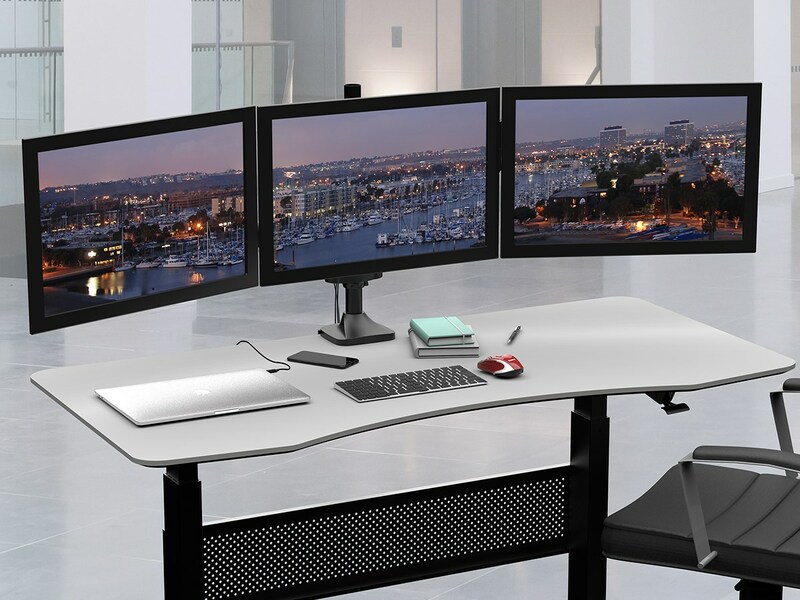 Space is also a factor; is there enough room to accommodate multiple monitors or only enough for a single display? With those options aside, there are a few features everyone can agree on; larger displays and a higher resolutions are preferred. A 27 to 34-inch monitor with a 2K resolution with IPS (In-Plane Switching) is nominal and allows for easy viewing for long periods without inducing headaches. AMD’s FreeSync and Nvidia’s G-Sync technologies can also be found in some of the higher-end displays which offer variable refresh rates to match the applications you use without ‘tearing’ or distorting the image. Other features that can be found on today’s displays are USB ports for charging mobile devices, connecting wireless keyboards and mice, and linking speakers and cameras for teleconferencing and social interaction. Monitor mounts are a great way to free up desk space or to manage more than one display while providing great ergonomics. There are many types of mounts which include: gas-filled arms, spring-loaded, a combination of both, and pneumatic mounts. These allow users to remove the monitor stand for increased adjustability, including height, tilt, rotation, and position, all of which help to prevent neck and eye strain. Every mount is rated for weight and size with options for single or multiple displays and can be connected directly to a desk or mounted on walls. There are also mounting options that allow you to adjust the height and angle of setups for different peripherals along with the monitors, such as a keyboard or laptop risers. Most of these platforms require VESA-rated displays, so make sure your monitor is equipped with the appropriate screw mounts before purchasing a mount. Computer peripherals are another category that falls on the personal or preference side and encompasses everything from keyboards to USB hubs and everything in between. For keyboards, there are wired or wireless, dome or mechanical keys, large or compact sizes, and ergonomic or standard designs. The most popular today are those with an ergonomic design with mechanical switches which offer an excellent build quality and lessen the chance of getting carpal tunnel syndrome. Mice also come in both wired and wireless versions with varying levels of ergonomics, depending on your preferred application. Optical tracking can also be a consideration with differing levels of cursor control. Memory card readers allow you to upload data from different mobile devices in many different form factors, such as micro SD, M2, Flash and memory drives (among a host of others). These are great for those that work in both the field and home office. Depending on the number of peripherals you have, it’s probably a good idea to get a USB hub for data transfer and power options. These come in many different styles, number of ports, 2.0 or 3.0 speeds (from 480Mbps to 5.0Gbps and more), and are incredibly affordable depending on the features. While printers are technically peripherals, they can also be stand-alone and print directly from mobile devices and storage media. There is a myriad of different styles of printers on the market, which are also a matter of personal preference. All-in-one (print, scan, fax) versions are the most popular found in most home offices and use inkjet or laser toner cartridges. This is where it gets frustrating for most of us, as it can be challenging to find the exact make and type required for your particular printer. Most brick and mortar stores are expensive, and that’s only if they carry the ink needed. Otherwise, most choose online outlets to find what they need. To help eliminate frustration in trying to find the correct cartridges, Monoprice offers an Ink Finder that can point you in the right direction. This allows you to easily search by product brand with subsequent options for printer types and models for most current models on the market. This saves time over searching through pages of products that associated with what you’re looking for. Cables and adapters are an often overlooked component in home offices, but without them, the office becomes a sitting room with a lot of inactive hardware. There are as many cables, adapters, switches as there are stars in the sky (seemingly anyway), so choosing the right kind and style can be a daunting task. Displays require a reliable HDMI, DVI, Displayport, Thunderbolt (for Macs), or VGA cable, while modems and routers take advantage of CAT5/6/7 cables for wired internet and network connections. Similar for peripherals, Do they require USB or Firewire and which version? Have a sound system in the office? These too have their specific cables, including coaxial, 3.5mm, RCA, digital, and optical TOSlink cables. Adapters run into the same issue, which are used to turn one connection type to another without the need to buy different hardware. For example, if your monitor has only HDMI connections and your PC only supports DVI, you can use an active adapter to connect them both without signal loss. There are adapters for everything from displays to audio systems, and choosing the right one is not always easy. Most online retailers will have categories for different types of cabling or adapters, but choosing the best can take a lot of time, especially if you have to browse through a myriad of product listings. Choosing the correct cable for example, can render hundreds of results when only one or several different types are needed. This is an area where the Monoprice Cable Finder can help in locating what you need quick and conveniently. Simply click on platform that’s required (computer, mobile device, audio/video, etc. ), and cycle through the easily navigated sub-menus to see the correct results. When it comes to creating the perfect home office, you’re only limited by your imagination. You can spend days, weeks and even months looking for the right products or great deals, which can span multiple retailers. Another route is to shop a single retailer that has everything you need with everyday affordable products. This route will ensure you get what you want and have it delivered on the same day, leaving you to create your perfect home office all in one go rather than over several days or weeks. Your office should be a reflection of you, a space where you want to spend time to be productive and creative in without many distractions. The perfect home office is one where you are comfortable, whether it’s similar to a top-end CEO or merely a furnished spare room. The ideal space is one that produces a positive feeling, and your work will reflect that.